GARY, Ind. 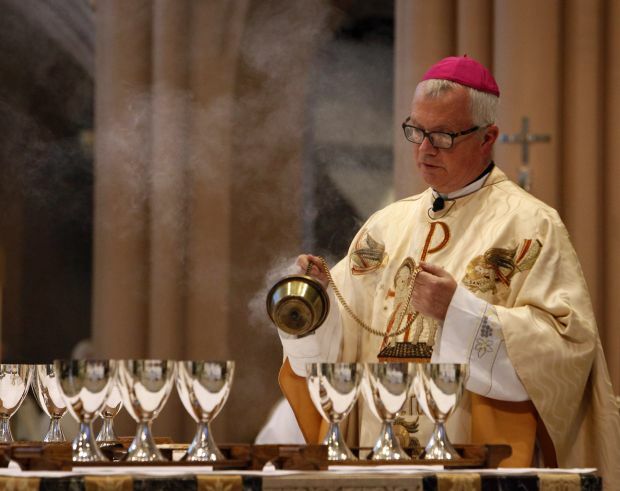 (CNS) — Before a packed Holy Angels Cathedral and a television and online audience, Bishop Donald J. Hying was installed as the Diocese of Gary’s fourth bishop. In what Bishop Hying called “a glorious adventure in faith together,” the 51-year-old bishop formally accepted the apostolic mandate from Pope Francis naming the former auxiliary bishop of Milwaukee as the new spiritual shepherd for 185,000 Roman Catholics in Northwest Indiana. “We renew our dedication to Jesus and his Church, to the proclamation of the Good News and the service of the poor, to lives of prayer and service, to help heal this world that often seems so old and broken,” he said. Filling in for Archbishop Carlo Maria Vigano, the apostolic nuncio to the U.S. who could not attend because of a snowstorm, Archbishop Joseph W. Tobin of Indianapolis read the apostolic mandate, which was presented to the acting chancellor and the consultors before being shown to the entire assembly. To lay ecclesial ministers, parish council leaders, volunteers and other lay faithful from the 68 parishes in the diocese, Bishop Hying extended his greetings and love. The new bishop also addressed the diocese’s African-American community, Asians, the deaf and those with other challenges and abilities. “All of you are close to the heart of Christ and an integral part of our local church,” Bishop Hying said. Born in West Allis, Wisconsin, Bishop Hying was ordained a priest for the Archdiocese of Milwaukee May 20, 1989. He was ordained as Milwaukee’s seventh auxiliary bishop July 20, 2011.